Most of the valley land in South Lake County was usurped in the 1840s by the awarding of two Land Grants by Mexican governors, before California became a part of the United States. Together they contained about 30,000 acres. The Collayomi was granted as containing three Mexican leagues; the Guenoc six leagues. After the U.S. took control, the government revised its conversion of leagues to acres several times, varying from early conversions of 4605.5 and 4438.68 acres to 4428 acres, conveniently lopping off 4,000 to 5,000 acres included in the original boundaries. The grant lands are shown in the lower part of Lake County, occupying a greater area than Clear Lake itself. More than one-third of Lake County is comprised of U.S. forest land. Most of the county is mountainous. Lake County did not exist until 1861. Nor did Napa County or the State of California until 1850. 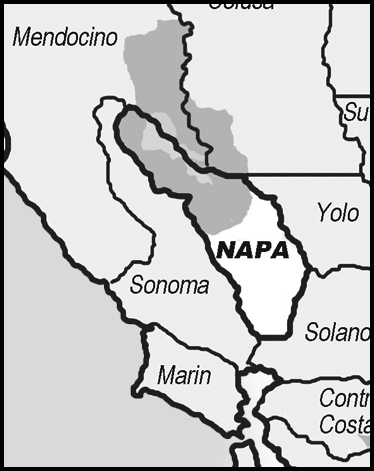 The grants were situated in the Nappa Valley area of the Sonoma Precinct in "El Frontera del Norte," the "northern frontier. Napa County boundaries in 1852. Notice that half of Clear Lake was in Mendocino County. 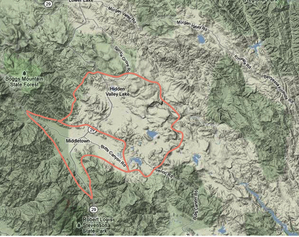 The boundaries of the Rancho Guenoc and Rancho Collayomi can still be seen on today’s Township, Range and Section maps,as in this recent view on Google Earth. Highway 29 runs vertically through both. Highway 175 leads westward from Middletown to Cobb, and Butts Canyon Road heads eastward, paralleling the boundary of the Collayomi grant and then crossing over onto the Guenoc. 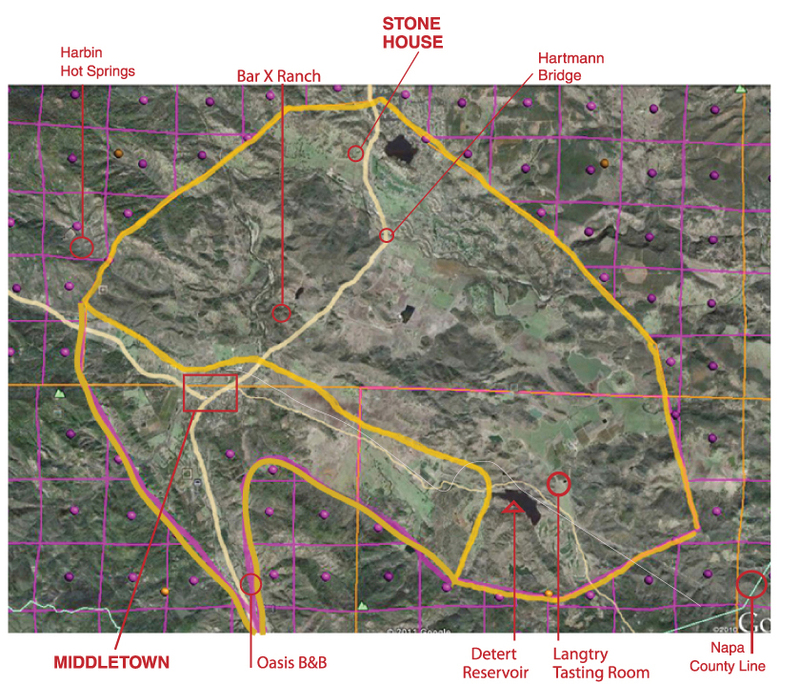 Another grant, ostensibly awarded earlier but denied verification by the U.S. courts, was claimed by Salvador Vallejo and would have included all of Clear Lake and all of the valley land around it. It held approximately 70,000 acres, more than twice the size of the southern grants. When the claim was denied, in 1853 or '54, all of that land became U.S. property available for purchase at very reasonable prices or for homesteading. The boundaries seen above are those set by the official U.S. government surveyor in 1857. History suggests that when the grants were made in the mid-1840s the boundaries more closely followed the topography. The topographical view also makes it clear that the earliest American explorers into this area probably came in from the Sacramento Valley following the course of Putah Creek, which runs through the center of Rancho Guenoc, or Cache Creek , which leads into Lower Lake.